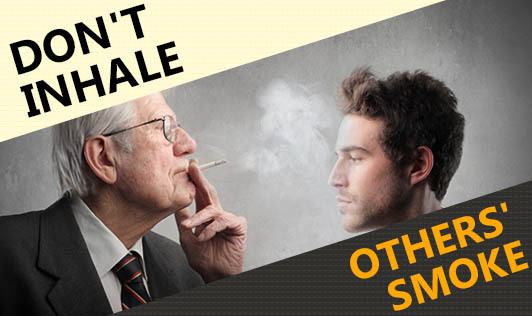 Second-hand smoke (also called passive smoking OR Environmental Tobacco Smoke) can be as dangerous as active smoking. Passive smoking causes lower respiratory tract infection, lung cancer, and heart disease, and is responsible for more deaths due to heart disease than due to lung cancer. About 17% of lung cancers among non-smokers can be attributed to high level of cigarette smoking by parents during childhood and adolescence. Environmental Tobacco Smoke (ETS) is a deadly mixture of smoke given off by the burning end of a cigarette, pipe, or cigar, and the smoke exhaled by the smoker that might just "puff' a nonsmoker's healthy existence away! Tobacco smoke is a complex mixture of gases and particles that contain myriad chemical species of almost 4000 compounds. Of these, more than 40 are considered to be carcinogenic (cancer-causing). There is no safe level of exposure to ETS and therefore it is in your best interest to AVOID PASSIVE SMOKING!